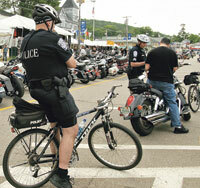 This year marks the 89th Annual Laconia Motorcycle Rally in picturesque New Hampshire. With more than 250,000 expected visitors, the NH DWI Lawyers remind our fellow riders and friends to BE SAFE and Don’t Drink and Drive. As motorcycle riders ourselves, we understand that mixed New England weather always seems to send throngs of people flocking to the beer tents- to avoid either the rain or scorching sun. Either way- if you will be riding your motorcycle back to your hotel or campground please limit your alcohol intake to avoid a DWI arrest at Bike Week. The Laconia Rally is one of the premier motorcycle Rally’s in the world. And, with so many visitors to the New Hampshire Lakes region, police are out in force. In 2011, the local Laconia, NH law enforcement authorities reported 68 arrests for driving while intoxicated. This year, State and local police are again planning aggressive enforcement aimed at detecting and apprehending impaired drivers. If you are arrested in Alton, Barnstead, Belmont, Center Harbor, Gilford, Gilmanton, Laconia, Meredith, New Hampton or any surrounding town in New Hampshire for DWI, DUI, OUI or BWI (boating), call today and consult with our experienced and aggressive criminal defense lawyers. We offer a free initial telephone consultation and case evaluation and are available to discuss your NH DUI at 603-624-0390.